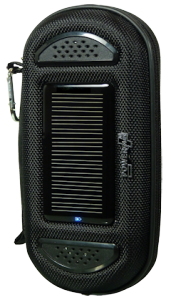 The POWERplus Jaguar is a combined Solar-USB powered powerbank-charger and speaker. Keep your mobile and accessories in this handy pouch. Plug your mobile phone in to enjoy a great audio experience through the 2 x 3W integrated speakers. Charge your mobile phone with the integrated battery.